So I’ve come across a new toy: a Dimension SST 768 3D printer! But, it was having some difficulty turning on and working. Tearing into the back of the system, I found three DC power supply boards (24V, 12V+5V, and 120V), a single-board computer, an overly-complex logic/controller board, and what’s labeled a “Power Distribution Board” which connects to all the steppers and other hardware. First order of business was to check the power boards, which were all spot-on voltage output. Ruling that out, I needed to see what was going on during the boot process. Thanks to another helpful blog post, I discovered that the SBC was an Ampro P5v – which was awesome, because the label for the board is buried under another one, and I couldn’t see it without tearing it all down. Didn’t feel like it that day. I dug out a ten-pin connector with ribbon cable attached, from an old 9-pin serial backplate. 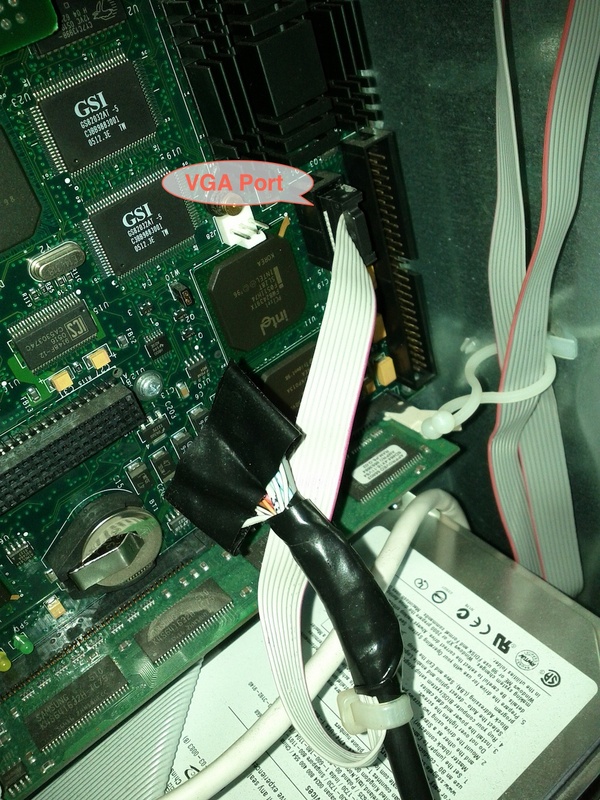 Snipped off the serial port, sacrificed an old VGA cable (since there were no DB15 jacks in my junk pile), and rigged up an adapter. It works perfectly! There are also keyboard and USB and all the other I/O you could want on that SBC, documented in the manual. Now that we’re in, it’s time to root the beast, turn on SSH, bypass the cartridge EPROMs, and make some awesome. My beloved MakerBot, your big brother has arrived! I have hooked up my printer to a monitor and keyboard. I was hoping I might be able to probe around and find where the temperatures and such are configured. However it seems that my machine does not have any common file browsers installed. Nor have I been able to install any as it seems to not have yum either. I’m just briefly familiar with Ubuntu and have no experience with RedHat. Have you done any investigation into the temperatures? Hi Ben! I haven’t had much time to dig into the depths of the printer, yet, so I can’t really offer much advice. Plus, I don’t have it nearby right now or I’d go look and see. One thing I would highly recommend is making a backup of the entire hard drive, just in case you accidentally screw up a file, or even in case the drive dies. Getting it replaced with all the software would probably be difficult. Be careful in there, but have fun with it! We shipped it to a diff location and since that it boots one in a blue moon. What I was able to discover is that if we shake the printer at the same time the blinking green light on the logic board, then it boots and runs perfect, print very well, but from time to time will simply loose power and goes off, when we are able to reboot it, it tells us that it has recovered from an uncontrolled loss of power and ask to continue, which we do and everything starts all over. It can not be the main board or logic board, i am thinking it has a bad power supply or a power connection loose somewhere, or maybe a bad power board? What do you think? And how do I test it, I don’t know how and where to test the power on that machine (I have a tester). All help is highly appreciated. I am by no means an expert with that machine, but I have spent a little time inside it. 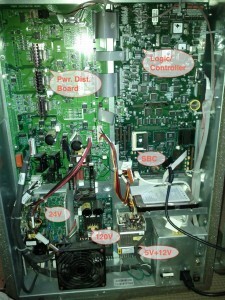 It is essentially a computer with a mechatronics control board. The back comes open fairly easy, and most of the boards are exposed and easy to get to. Do take care not to zap a board, as I’ve heard that replacements from Stratasys are silly expensive. Listen very closely to the hard drive. You may need a mechanic’s stethoscope or something (maybe even a piece of hose) if you can’t get your ear right up on the drive. If you hear it making a clunking noise, the drive is dying and you’ll need to replace it. It contains the operating system and software, so you’ll need to copy the entire thing over, which may present a problem if the drive is dead. Not sure if you can use a copy from another machine… If you can log into the machine’s console when it’s booted, you could also check the drive’s SMART diagnostic information to see if there is any trouble. Disconnect and reconnect all the connectors. Do them one at a time so they go back in the correct place and with the correct orientation. Old connectors get wiggly and oxidized, sometimes this is all it takes. Check the voltages coming out of the power supply, right on the power supply itself. I don’t recall exactly, but it’s likely that the various power supply outputs are labeled for what voltage they should be at. It’s not uncommon for older equipment to drift out of spec, as the electrolytic capacitors age and dry out. Anything that’s more than 5% out of it’s rated value is suspect, typically. There may be adjustments on the board, I don’t know. You also want to inspect all the electrolytic capacitors for signs of capacitor plague or otherwise defective. Any that are puffy or leaky are certainly in need of repair. If you aren’t comfortable doing this, ask for help from someone with a good background in electronics. Be careful around the power supply, as it’s a big one, and I always recommend wearing a proper ESD wristband that’s bonded to the chassis of the machine. ESD is a bigger problem than most realize! Hopefully it’s something simple and you can get it running with just a good wiggle. Good luck with it!! p.s. – if the hard drive checks out good, you may want to make a dd image of it as a backup (ask a linux nerd if you don’t know what that means). Hard drives will all fail over time. By the way I just bought another broken stratasys dimension and will try to fix it like this one. I will let you know when its here. Do you have the disk image for 768SST? Hi, I have a question. 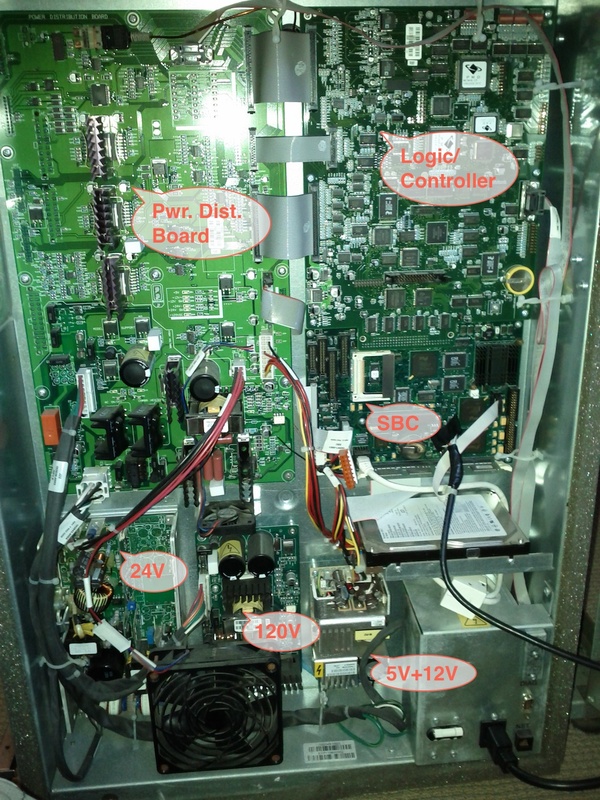 Our Stratasys 768’s power distribution board can output all the voltages except for the 12V. Any ideas why? Would you have a schematic that could help us figure out why 12V isn’t being produced? Hi Alex: Check temperature snap switches. In my SST was 12vcd lost because Chamber thermal snap switch.